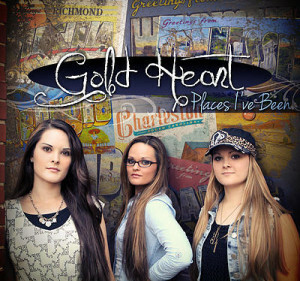 Gold Heart, featuring the Gold sisters Tori (mandolin), Jocey (guitar), and Shelby (fiddle) have been touring worldwide and astounding audiences with their fun personalities, intense harmonies and brilliant musicianship since 2005. Joined on stage by their father, Trent on bass, and their brother, Kai on banjo, this is an outstanding act in every sense. With nearly ten years on the bluegrass scene, hundreds of live performances and now four albums under their belt, Gold Heart is elated to join Mountain Fever Records. Family harmony is considered one of the staples of bluegrass and acoustic music. There is nothing like it, especially when it is set against a backdrop of superb musicianship. Such is the case with Places I’ve Been, the new album from Gold Heart. If the lilting, three-part, sister harmony doesn’t put a smile on your face, the youthful originality of the songs, chock full of fresh ideas and melodies, will. In fact, all twelve songs on Places I’ve Been were written by members of the talented Gold family. This is an album full of their original songs proving that they have rounded out their talents in every aspect of the business. For Places I’ve Been, the sister-trio asked their good friend and mentor, Ron Stewart to produce and also lend his banjo talents to the project. The album is a true listening experience, with topics of family, love and heartbreak intertwined throughout the album. Gold Heart’s single “Ain’t That Crazy” hit #2 on the Bluegrass Today Radio Charts on June 26th, 2015. Highlights include a major International tour of the United Kingdom, performances in 25 US States and multiple appearances in Canada. Gold Heart was invited to perform as a 2009, 2014 and 2015 IBMA (International Bluegrass Music Association) Official Showcase Band. Gold Heart has been featured twice on the PBS television program “Song of the Mountains”. That program reaches thousands of viewers Nationwide. Most recently, Gold Heart completed their first European Tour, with performances in Germany and Austria. These young artists are expert songwriters, with Jocey and Shelby contributing the majority of the band’s impressive material. At age fifteen, Jocey was one of three finalists of 983 contestants in the 2008 Chris Austin Songwriters Competition (bluegrass category) at MerleFest. The work of the sisters can be heard on their previous recordings, My Sisters and Me, Never Let Go and Journey to Heaven’s Bright Shore. Tori, Jocey, and Shelby exemplify why acoustic music has a very solid future. They give God the glory and credit Him for their talent and inspiration. 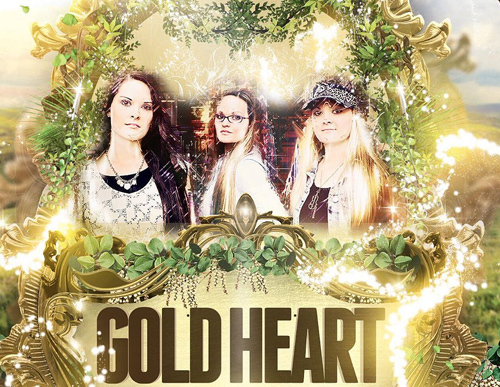 In the hands of young musicians, singers and writers such as Gold Heart, it can’t miss!